Do you want to interact face-to-face with Former Prime Minister of Australia Mr Kevin Rudd? Do you want to consult with nearly 20 Australia’s popular investment project owners? Do you want to hear from Professor He-Ling Shi, the top 25 economists in Australia, delivering talk on the topic of 2018 Global Economic Outlook? Do you want to know about the new actions that will be taken place in 2018 by a2 Milk Asia Pacific CEO, Tianjin Tongrentan and The Goubuli Group CEO as well as The Alibaba Group ANZ branch CEO? Do you want to hear the discussion between Investment Authority of Victoria, Chinese investors whom are in charge of billion dollar of funds, the three major industry associations, the world’s top 500 scientists as well as investment lawyers on their opinions? 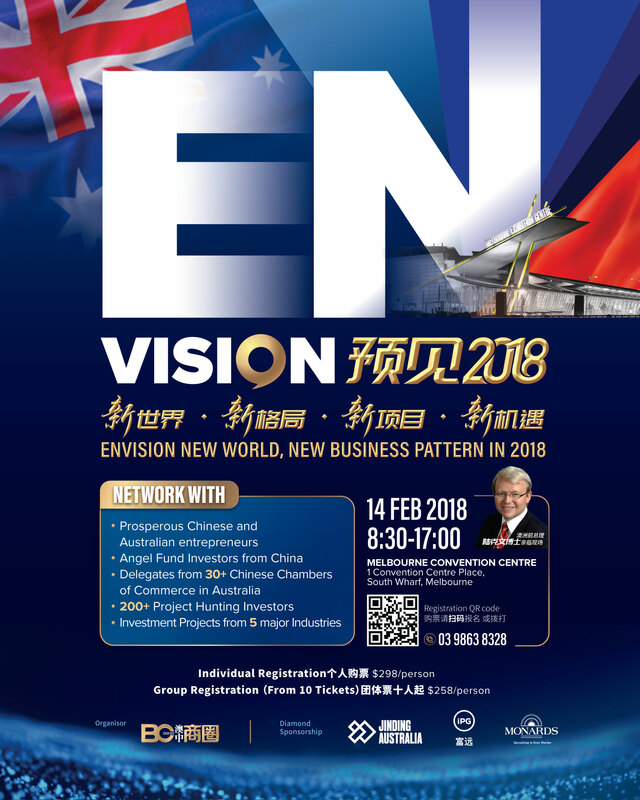 The Envision 2018 Business Forum will be held in Melbourne Convention Center on 14 Feb, 2018. We are proudly presenting our Honorable Speakers—-Former Prime Minister of Australia Mr. Kevin Rudd, Managing Director of Alibaba Group ANZ Ms. Maggie Zhou, CEO of a2 Dairy Asia Pacific Mr. Peter Nathan, Founder of Goubuli Group, Mr. Yansen Zhang, etc. You will be able to have a selfie with Kevin Rudd and network with 200+ C-level investors and HNWIs on site. Meanwhile, you will also witness 16 projects connecting to their investors. Register Now to ensure your slot in this annual business feast!